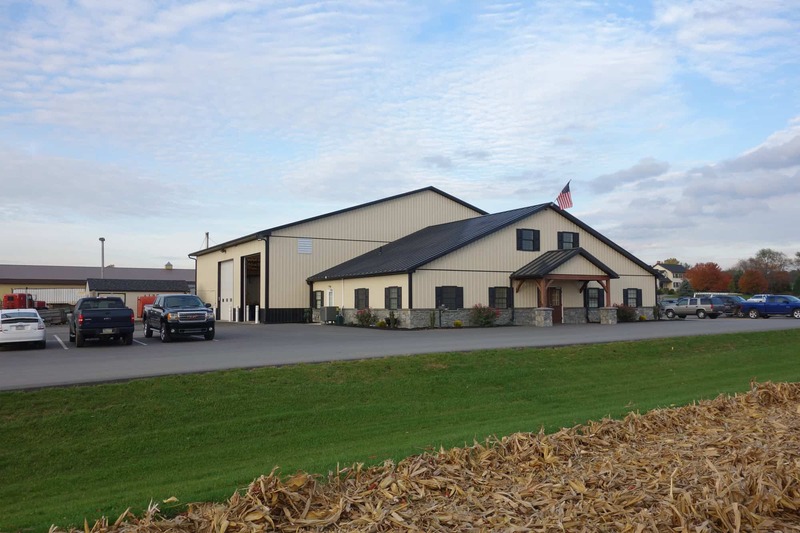 Family trucking company owners Phil and Ryan Garber of GFI Transport in Mount Joy, PA, approached Quarry View Construction for much needed new facilities. They were servicing their fleet of trucks and trailers in a building they’d outgrown and were operating their office out of two trailers. The Garbers needed a new office space as well as a shop custom made to service their fleet of trucks and trailers. We built a 5,000 square-foot shop with concrete flooring and poured concrete walls with metal siding and roofing. GFI maintenances their trucks and trailers year-round, so an adequate facility customized to their needs was of utmost importance. Scissor trusses in the shop open up the ceiling to 22 feet, providing more room to accommodate large equipment. We recommended radiant floor heat, an eco-friendly heating system suitable for buildings used for repairing large equipment. In the cold winter months, radiant floor heat keeps workers warm by radiating heat from the floor up. GFI installed a new furnace in their shop that runs on recycled waste oil from their fleet of trucks, another money saver that benefits the environment. We also created a block firewall between the shop and the office as a code requirement and a mezzanine that provides extra space. We built a 2,400 square-foot office with 800 square-foot attic trusses above the office, which provides extra storage space and an option to add additional offices as the company grows. A truly aesthetically pleasing building, stone wainscot, decorative shutters and the American flag proudly flying on the porch roof combined with exposed decorative wood frame lend the office a warm and inviting look inside and out. The Garbers are thrilled with the layout and design of their new shop and office and their employees love the facilities, which have resulted in a smoother workflow and a pleasant, spacious office environment. The radiant floor heat, wood frame construction, use of recycled waste oil for their furnace, and energy efficient heating and cooling system provide eco-friendly options that have also reduced costs, including lower electric bills!